That's the IOH voltage, should I still set it down to 1.10V? Another thing to try is to reset CMOS, then set everything up again. Sometimes I forget after a BIOS flash, and things become unstable. I auto'd everything and put the stock settings in for now and am running single channel 8GB ok... I'm afraid to touch it now...maybe I'll save the cmos profile and then load my 3.8ghz one again and try your ideas. Wonder if a slot is bad. Has it been this way from the start or been getting worse? No I don't think it's any specific slot, I think this board's just a POS and not compatible with higher density sticks. Really all i can do left is test Cap's Xeon and perhaps a 2 or 3 2GB sticks if someone would let me borrow them so I can decide if my CPU and motherboard can be a coupon at lessening the expense of my new platform or if they'll meet a swift death via a sledgehammer...I'm running stock and auto everything and even removed a stick just to lower my blood pressure. I'm questioning IVI's overclocking abilities. What cooler are you running? I was able to score 4.2ghz on my old set of OCZ sticks but they board started having all its issues with my patriot sticks. Glad my new one is playing nice with them. That was one golden 920, glad it still is! I was just using a Titan Fenrir on my test bench. Just something simple. I'm going to put it on water to see how far it goes once I see how lot the voltage can get at 4.2GHz. Did you start from my 3.8ghz profile or from scratch? I'm curious what values you're using now compared to what I had. 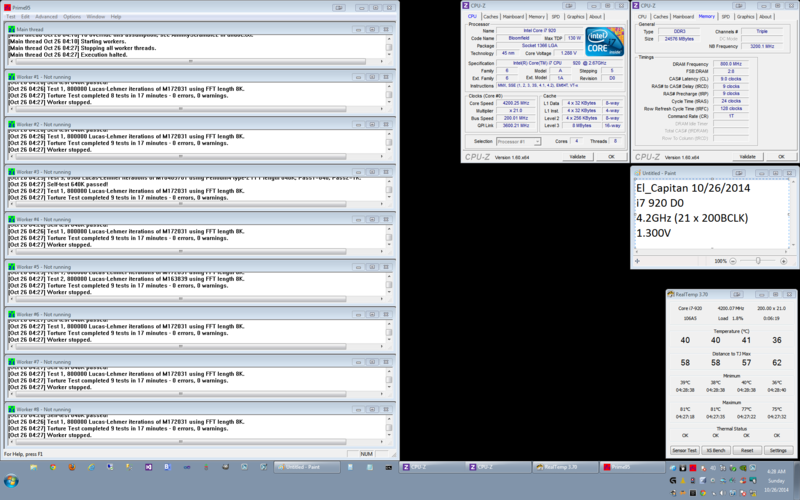 I thought I remember running about 1.3v for the vcore for 4.2ghz as well but the rest of the voltages I'm unsure of. I started from scratch. Mostly disabled the usual stuff, some Auto voltages set at minimum with 2 sticks of RAM when I started. Then upped the VTT/QPI to 1.25V for 6 sticks. Once I get the minimum VCore, I'll start lowering the VTT/QPI for that set. I'll take screenshots when I'm done testing on the test bench. Wow, than it must not have liked me or maybe I had TOO much voltage for the QPI...hmmm. As long as someone is able to squeeze out its potential. Now I know just how big of a difference compatible memory can make!